Black carbon from combustion processes accelerates climate change effects. They rise on plumes of hot air from belching exhaust. They grime the faces of industrial workers. They fleck cars after a fire. And, these tiny particles of soot, ranging in size from a few nanometers to a few microns, have a big impact on climate. 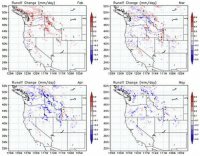 Regional climate models reveal how soot-covered snow affects climate and water availability in the western United States. Scientists have long known that soot—the common name for black carbon—from burning fossil fuels and biomass changes the way sunlight reflects off snow. However, until 2008 little was known about how this process affects the regional climate and water cycle over a specific geographic area. PNNL scientists were the first to show how a layer of soot on snow increased the surface air temperature between 0.1 and 1.0°C over the majority of the snow-covered areas in the western United States. This increase caused earlier snowmelt. Instead of happening in late spring, frigid water came rushing down rivers and streams in late winter. In the past, scientists had used global climate models to study the effects of black carbon. But these models were not entirely effective in representing the diverse terrain and land surface types of a smaller region. Instead, the PNNL team used a regional climate model to provide the necessary spatial resolution and more accurate and realistic snowpack and stream flow results. Regional models chop the space into smaller grid squares than those used in global models, and they use local hydrologic information to drive the model. The team's simulations showed when snow became "dirty" from soot it absorbed more solar radiation and warmed the ground and surrounding air. The mountain snowpack decreased between 2 to 50 millimeters (0.08 to 1.97 inches) during late winter to early spring. This means less snow accumulation in winter, less snowmelt in spring, and earlier spring melt dates. For regions like the western United States, which gets almost 75 percent of its water in reservoirs from mountain snowmelt, the presence of black carbon could mean earlier snowmelt—and therefore less snowpack in the summer months when water is needed most for power, municipal water, and irrigation. 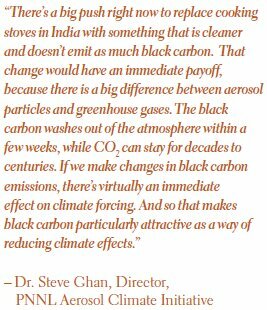 Black carbon trumps greenhouse gasses when sooty snow causes early runoff, stronger monsoons in Asia. In another study, researchers at PNNL, the University of Michigan and NOAA found that soot landing on snow on the massive Tibetan Plateau can do more to alter snowmelt and monsoon weather patterns in Asia than carbon dioxide and soot in the air. Their results were reported in the March 2010 on line issue of Atmospheric Chemistry and Physics. To find out how much soot is affecting the Tibetan Plateau's region, the research team used a global climate computer model, the Community Atmosphere Model, which DOE and the National Science Foundation funded. The model allowed them to examine a mixture of possible scenarios, including if soot sat on the Tibetan Plateau's snow, if soot was floating in the air above the plateau, and if increased carbon dioxide was in the air as a result of industrialization. The Tibetan Plateau acts like a natural heat pump for the region's weather. Reaching 5 miles high in some places, the air above it is warmer than other air at the same elevation. This warm air strengthens circulation around the plateau and causes the iconic, drenching monsoons that move through the region every year. But the Tibetan Plateau is increasingly bare. And soot, which causes early snowmelt in the western United States, is the trigger for snowmelt leading to less snow. And less snow means the Tibetan Plateau is absorbing more sunlight. The researchers hypothesized that this condition is causing the atmosphere above the plateau to get warmer sooner than other areas that don't get a blanket of soot. They used climate models to find out if this affects the area's monsoons. The surface temperature above the Tibetan Plateau increased by more than 2 degrees Fahrenheit in May due to soot on snow alone. The researchers found that this warmer air above the plateau rises and air is drawn from India to replace it. In turn, moist air hanging above the Arabian Sea and Indian Ocean blows in over India. 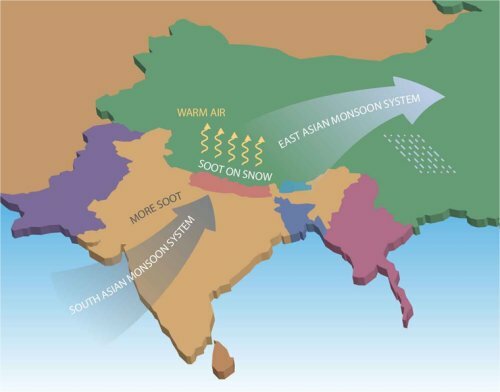 Known as the South Asian Monsoon system, this southwest-northeast flow also brings in more soot from India to the Tibetan Plateau that perpetuates the cycle. As a result, the researchers found that the South Asian Monsoon system is starting earlier and bringing more rain to central and Northern India in May than it would without soot on the plateau's snow. The soot-on-snow effect lingers throughout the summer and causes another weather shift in the East Asian Monsoon system over China. By July, much of the plateau's snow has already melted. The plateau's bare soil is warmer and further heats the plateau's air. Coupled with cool ocean air nearby, the plateau's heat strengthens the East Asian Monsoon. The models showed that rain increases 1 to 3 millimeters per day over southern China and the South China Sea. The strengthened monsoon advances to northern China, which also receives more rain than it would otherwise, while the rains mostly skip central East China, including the Yangtze River Basin, an important region for agricultural production. The researchers concluded that soot on snow triggers the Tibetan Plateau's annual glacial melt to happen sooner each year, causing farmers below it to have less water for their crops in the spring and summer. In a domino effect, the melting then prods two of the region's monsoon systems to become stronger over India and China. Black carbon—not the grimy end. Research on black carbon has demonstrated that these aerosol particles cause early snowmelt and change climate conditions. But there are still many unanswered questions about the relationship between black carbon and all other aerosol particles in the formation of clouds. Cloud/aerosol interactions are still largely undefined, and because clouds can both cool and warm the Earth, this area of study continues at DOE. The regional climate modeling of the western United States was done by Yun Qian, William I. Gustafson Jr., L. Ruby Leung, and Steven J. Ghan, PNNL. 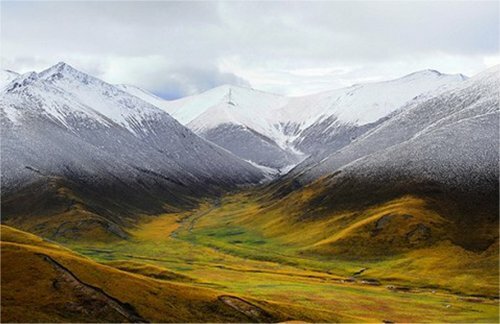 The Tibetan Plateau research was done by Yun Qian and L Ruby Leung of PNNL; Mark Flanner of the University of Michigan; and Weiguo Wang of NOAA National Centers for Environmental Prediction. Qian, Y, WI Gustafson Jr., LR Leung, and SJ Ghan. 2008. 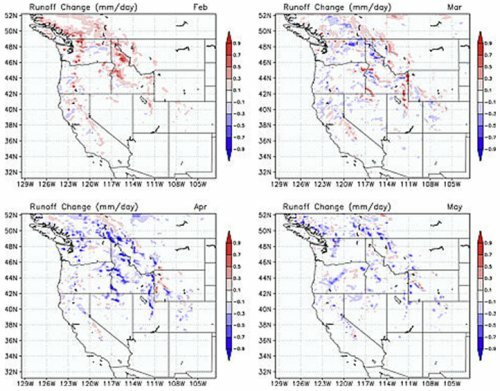 "Effects of soot-induced snow albedo change on snowpack and hydrological cycle in western U.S. based on Weather Research and Forecasting chemistry and regional climate simulations." Journal of Geophysical Research Atmospheres, 114:D03108. DOI: 10.1029/2008JD011039. Qian Y, MG Flanner, LR Leung, and W Wang. "Sensitivity studies on the impacts of Tibetan Plateau snowpack pollution on the Asian hydrological cycle and monsoon climate." Atmospheric Chemistry and Physics, 11, 1929-1948. How do aerosols get measured? Observational data provided by the U.S. Department of Energy's Atmospheric Radiation Measurement—ARM—Climate Research Facility are used by scientists to develop and validate computer models that simulate how climate processes work. PNNL scientists use aerosol measurements, including black carbon measurements, obtained by the user facility's permanent, mobile, and aerial research platforms to examine how natural and human-made aerosols influence how clouds form and how much light they absorb or reflect.